It’s easy to understand why many people looking for a new home are turning to FHA insured loan programs. Because FHA Loans are insured by the Federal Housing Administration home buyers have an easier time qualifying for a mortgage. Those who typically benefit most by an FHA loan are first-time home buyers and those who have less than perfect credit. In response to the growing housing situation in the United States, the loan limits for FHA Loans has been temporarily raised. Depending on where you live you might find it even easier to qualify for an FHA loan. As FHA Loan specialists we can help you understand any new changes to the FHA loan program. We’re here to create a customized solution that works best for you and your family. To learn more call us at 559-584-6633 or contact us via email by clicking here. When you’re applying for an FHA loan the following list of documents will help expedite the process. We can help you understand any part of the FHA loan process so don’t hesitate to contact us with any questions. Past two years W-2’s, 1099’s and any other necessary tax forms. If you’ve filed for bankruptcy you must wait at least 2 years and have good credit since you filed. Only certain properties are eligible – single-family homes, condominiums, double-wide manufactured homes, modular homes and 2-4 unit properties. 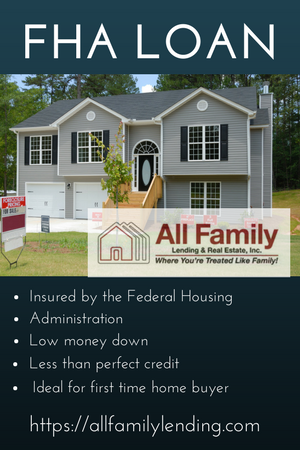 At All Family Lending & Real Estate Inc we want to help you understand how a FHA mortgage loan works. In all actuality the Federal Housing Administration (FHA) doesn’t loan any money, they insure it. This means that you’re considered to be a less risky borrower than someone who might not have the backing of the federal government. Our role is to make sure that you qualify for an FHA mortgage and structure our loan to reflect it. The other pages in the FHA loan center can help you understand more about this unique program. Whether you are trying to determine if you qualify or if you are interested in finding out what kind of documentation you’ll need to ultimately get your loan, our site can provide you the information you are seeking. Additionally we’re more than happy to take your phone calls at 559-584-6633.